Condition Notes The normal mini van #450 in a nice shade of Police blue and with bars on the rear windows. 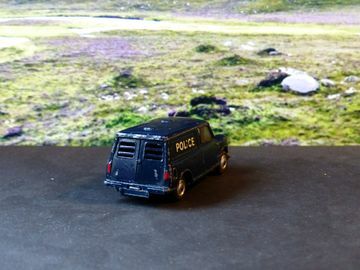 In the box were a police dog on a lead held by a police handler in a nice scene set type of cardboard display. I had one of these but have no idea where either the car, do or police chap went. Here is a model in decent condition - actually far better than the photos seem to indicate. The paint loss is hardly noticeable as I look at the car in front of me. I have switched the dog, handler and lead to the other one I have for sale as that looks slightly better. This one, at the moment therefore, is just the van. If I can track down the extras then I will revise the listing.